Improvements in hiring and unemployment were widespread across most states in February. NEW YORK (CNNMoney) -- Unemployment fell in 29 states in February and rose in only eight, the government reported Friday, in another sign of broad improvement in the U.S. labor market. The improvement means there are only three states with unemployment above the 10% mark -- Nevada with a 12.3% unemployment rate, Rhode Island, which has 11% unemployment, and California, where unemployment stood at 10.9%. North Carolina and Mississippi dropped out of the states with double-digit unemployment. As many as 19 states suffered 10% or more unemployment as a result of the recent recession. As recently as last September there had been 10 states with a jobless rate of 10% or more. Despite suffering from the nation's highest unemployment rate, Nevada did enjoy one of the biggest improvements in the month, as the 0.4 percentage point decline trailed only the 0.5 point improvement in Mississippi. The overall national unemployment rate was 8.3% in February, as government figures show employers adding almost 250,000 jobs on average over each of the last three months. 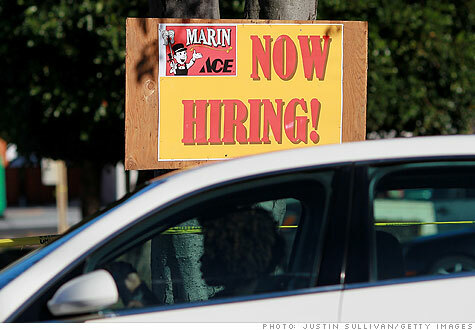 Friday's report showed that the number of jobs increased in 42 different states in February. There are now more states with unemployment rates under 5%, widely considered to be full-employment, than states above 10%. But the four states with low unemployment -- North Dakota at 3.1%, Nebraska at 4%, South Dakota at 4.3%, and Vermont at 4.1%, are among the smallest in population. Only one state -- New York -- has not had a drop in unemployment over the course of the last year. A 0.8 percentage point jump in unemployment in New York City in the face of Wall Street layoffs lifted unemployment statewide by 0.4 points to 8.5%. But there have been some notable improvements in unemployment in many parts of the country, as the jobless rate has fallen by a percentage point or more in the last year in 17 different states. Michigan has achieved the greatest improvement, a 1.9 point drop to 8.8%, driven by a rebound in hiring in the auto industry. Nevada's rate has fallen 1.3 points and California by 1.1 points, leaving only Rhode Island as a high unemployment state that has not enjoyed significant improvement.